If you'd like to drop a few pounds before summer, begin with changing your diet. Stick to fresh, whole foods, whole grains, veggies and fruits with detoxifying properties and eliminate caffeine, alcohol, and sugar to keep you feeling energized and your digestive system happy. Abstain from drinking soft drinks, using artificial sweeteners and drink more water. You can also take one Skinny Piggy gummi 30 minutes before every meal with a glass of water to keep you full between meals. Stepping up your workout routine may be all that it takes to slim down for the summer. Engaging in sweat-inducing boot camp workouts will increase your metabolism and help your body burn more calories so you will look your best on the beach in the summer. We all love eating delicious treats, but they unfortunately make us heavy. Now, there's a new fix to your fat loss issues that allows you to have a snack without guilt. 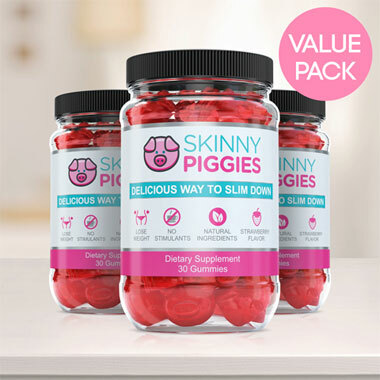 Skinny Piggies delicious appetite suppressing gummies are created to help you avoid carb cravings and make you feel satisfied, while promoting fat loss. The secret of weight loss is surprisingly simple: Consume less calories than your body uses daily and your body will start losing weight, guaranteed! However once you start cutting down calories, cravings will set in, and appetite and hunger become extremely difficult to manage. This is where Skinny Piggy Diet Gummies can help you! These delicious appetite suppressants are formulated to help you to stick to your dietary plan by making you much less hungry. Appetite is driven by two things: caloric consumption and the stretch in the stomach. After you eat a meal, your stomach fills up and the food stretches the stomach walls. This is what makes you feel full and you stop eating. When you take one Skinny Piggy about a half hour before your lunch with a large glass of water, it will gently form a gel, that activates stretch sensors in your stomach, letting your brain know you just had a big meal. That way, when you do eat, you're already somewhat full and end up eating a lot fewer calories. This way you can reduce appetite and food cravings, hunger, and eat less, all without feeling starving all the time. The gel also allows the stomach to empty slowly makeing you feel full longer. The sooner you are full, the less likely you are to continue eating that allows you to eat fewer calories. The viscous gel will slow down the digestive function of sugars that flattens the level of blood sugar. By reducing quick changes in your blood glucose you stop those unbearable cravings too. Eliminating blood glucose spikes in your daily life helps prevent food calories from being stored as fat. By putting your body in fat burning mode, our slimming gummies help you slim down. Skinny Piggies have no artificial additives - you can actually read and pronounce all the active ingredients. 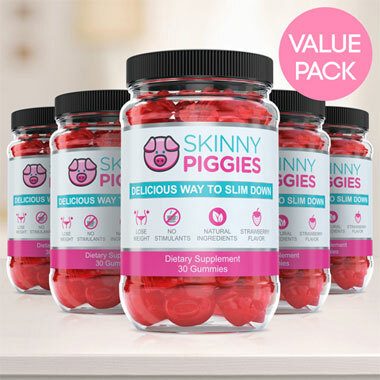 The beneficial, natural ingredients used in Skinny Piggies also have extra benefits such as support for strong hair & nails, potent anti-aging properties, and glowing skin. In addition to that, they contain absolutely no caffeine. That is a great fact because when you eat caffeine, not only you will be struggling with exhaustion and fatigue afterwards, but it restricts you from taking them in the evening. Take a caffeine based fat burner in the evening and you will not be getting any sleep. With Skinny Piggies, you can eat them even before going to bed - no problem. There aren't any restrictions with this diet gummy supplement. Finally, what other fat loss product is as yummy as a fruit flavored gummy? 'Thought so. Losing body fat is hard, but delicious Skinny Piggies are ready to make your efforts a little bit easier for you. You will love the refreshing flavor of these gummies so much, forgetting to take them daily won't be an issue. 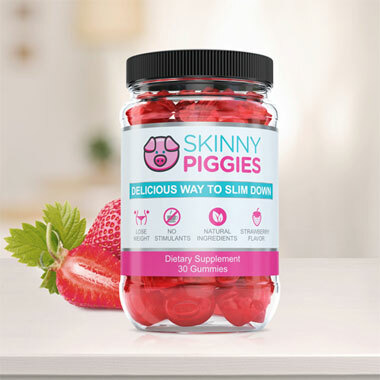 Skinny Piggies are supplement gummies that can help anyone.